This entry was not in response to leaving a job uninvolved in ministry for ministry; on the contrary, this was my reply to seven years (at the time) of intense and focused ministry with The Navigators. While it is the first mention of the word “pastoring” I can find in my writing, its use wasn’t to get out of vocational ministry, but rather to get deeper into it. That was six years ago – and that was after seven years of student ministry, as well as another three in college. Teaching has been in my blood from the beginning. My grandfather and mother were both educators, and over the years, God has given me many different opportunities and venues to develop my teaching skills, along with the confidence to utilize them in this way. To learn in order to help others learn to “get” whatever it is they want/need to “get” has been a strong driving force in my life. This is why I love to write; this is also why I love – yes – to teach. After 12 years of ministry with The Navigators, I came to Covenant Seminary because I wanted my main job and focus for this time to be the study of the Scriptures. I longed to be newly, deeply, and personally inspired by ideas and instruction from others, in a frequent and formal way, and in a setting and environment conducive to this intense input. I also hoped that, as a result, God would clarify his calling for my life and future ministry. For any of this to take place, Megan and I felt a drastic lifestyle change was necessary, one that removed a majority of distraction and placed limits on our ministry responsibilities over a period of time longer than a sabbatical or extension-learning program would. We also thought a new setting – one made up of other families pursuing similar goals (and with many of the same financial and family challenges) – would be beneficial to our chances of making it through this potentially turbulent period. While I believed I had some pastoral gifting, I had not necessarily envisioned (but at the same time had not negated) becoming a pastor; my thinking and goals at that time were more along the lines of preparing for advanced academic study at the doctoral level, as well as to ensure that any new role in the future might provide time for my writing. But, since coming to Covenant a year ago, reading five books on the topic of pastoring and the 200-page Pastoral Theology reader this past summer, as well as taking the recent two-week class, I sense a possible change of heart occurring and answers to prayer appearing with regard to my calling. This past Saturday, Learner took the “wretched” Bible Content exam for the fourth and final time (else he has to take the class). Needed score: 105. Earned score: 113. Class starts on Thursday. More as I have it. Megan and I got invited to our first Cubs/Cards game on Sunday night (thanks, Ted and Jill). In case you missed it, the Cards pulled a win out in the bottom of the ninth inning with Gary Bennett’s walk-off grand slam (his second in a week). The place went nuts. And so did we. As promised (and after way too much time spent on it – i.e. since the end of July), here’s the plan for the fall Bible class I’m teaching at Wildwood Christian School. The class begins this afternoon. If you’ve got nothing better to do the next four months, why not study along with us? The intent of Wildwood’s Bible class is to be a stand-alone study and support apologetic for Wildwood’s Humanities class, which this year is studying Antiquity – the development of civilization from the Flood to the Incarnation. By comparing various ancient civilizations, their structures, governments, arts, significant figures, and religious practices with those of ancient Israel, we will trace Israel’s development from a loose confederation of tribes to a monarchy to a divided monarchy to the dispersion throughout Persia. This study will include various internal and external historical touchstones (Mesopotamian leaders/events, Egyptian leaders/events), as well as key aspects of the Covenant and Israel’s growing (or declining) relationship with God, understanding why Israel was (and was to be) different from other civilizations. In addition, the class will have as its secondary purpose establishing some fundamentals of Bible study. We will briefly discuss the basics of hermeneutical methods, but will primarily achieve this goal through the practice and usage of methods and principles, honing our skills as well use them. A mentor of mine, Scott, once shared with me how he tries to keep from grumbling as he goes through life. In his early 60’s and yet to really come into the digital age, Scott says he imagines his mind as a kind of reel-to-reel tape recorder, with his thoughts and conversations with God and others making up his personal tape collection. Scott allows himself to play the tapes only twice in his mind; after that, he commits to mentally erasing the negative reels – those containing his grumblings – and instead tries to find better material to archive. I like Scott’s analogy, though I confess my reel-to-reel can be far too often on endless playback. …so I won't. Instead, I'll let the guy at Viva El Birdos do it for me, as I've been saying this about the Redbirds all summer long (talk to Megan to verify – she's tired of hearing it by now). …so I won’t. Instead, I’ll let the guy at Viva El Birdos do it for me, as I’ve been saying this about the Redbirds all summer long (talk to Megan to verify – she’s tired of hearing it by now). I just finished listening to Slate's follow-up podcast for their Euphemisms for "Stupid" contest, which aired Friday, August 17th. The original aired at the end of July. "One Gilligan short of an island." "One quark short of a proton." And then mine (which they said they really liked): "A few steers short of Texas." My entry is about 3 minutes and 40 seconds into the 15-minute podcast, and okay, granted, they didn't mention me specifically by name, but it's mine, I tell ya, it's mine. What did I win? Nothing, other than the opportunity to post the news here on the blog. Plus, my name is supposed to appear somewhere on this site (cheeseball as it is), and possibly as part of a new book later, but I've not seen a posting at the site or contract in the mail just yet. For all I know, this may be my 15 minutes of fame, so I'd better milk it for all it's worth. Once again, Learner found himself behind the grill at Friday’s end-of-summer edition of the seminary picnic. 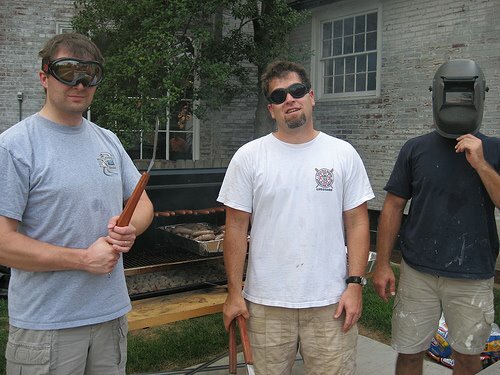 Eye protection was a must because of the smoke, but I’d say he kind of overdid it here. If all goes well, you probably won’t hear much from me until early next week. Now that my two-week Pastoral Theology intensive ended this morning, I’ve got a couple papers to write, the larger of which is a ten-pager on “whatever aspect of your understanding, personality or character you consider might be most problematic for a diligent and faithful ministry.” Folks around here just call it “the sin paper.” Only ten pages? At least I don’t lack for material. In addition to the paper writing, I’ll also be finalizing the syllabus for the high school Bible class I’m teaching this fall at Wildwood Christian School. I will (hopefully) post the class assignments here next week, just in case anyone wants to follow along in their own studies through the fall (I’m teaching on the history of the nation of Israel through the Old Testament, so again, no lack for material). I wanted to share a couple of really great links that, if you’re at all like me in liking things well-done, you’ll appreciate. The first is the Access Foundation‘s list of The Great Books, a mind-blowing bibliography “from the ancient classics to the masterpieces of the 20th century…that are all the introduction you’ll ever need to the ideas, stories, and discoveries that have shaped modern civilization.” Some of the links aren’t as up-to-date as others, but the list of books is impressive. Also check out Mortimer Adler’s Center for the Study of the Great Ideas. In case you’re preparing to teach any kind of biblical history this fall (in Sunday School, to a class, to your kids – whatever), be sure to check out the Bible Atlas Online, which has over 170 quality full-screen maps of biblical geography available for free download. These are some of the more attractive maps I’ve come across (especially for the price). I downloaded them all. If you’re a Mac user who also happens to be in school, check out 18-year-old Logan Collins’ site and his free Schoolhouse software. Set up with an iTunes-like interface, Schoolhouse is my new assignment organizer of choice and blows away my pseudo-hack of iCal to achieve a similar (but lacking) set-up. If you download it, leave the guy a donation as he’s just starting school (albeit at KU – “rock chawk chicken hawk”) and he could probably use the money. By the way, hat tip to Ed for most of these previous links. He’s a surf junkie. Learner shared with me this beautiful poem by George Herbert, about a pastor’s wrestling with his inadequacies and the call to the pastorate. The professor read it aloud – the only way to read poetry, Learner says – and apparently it was quite touching to the class. To leade them unto life and rest. Thus are true Aarons drest. Unto a place there is no rest. Poore priest thus am I drest. In him I am well drest. And be in him new drest. 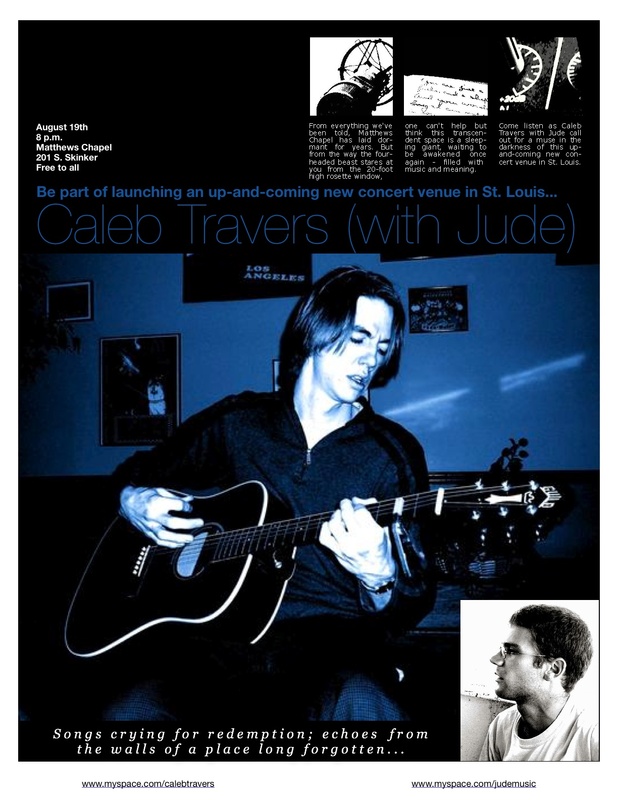 Here are two posters I created for my friend, Caleb Travers, who along with Jude, is playing Memorial‘s Matthews Chapel this coming Saturday evening, August 19th. Caleb and Jude write and sing songs about life, love, and other various and sundry “l” words guaranteed to be important to most all of us. Influences include Lucinda Williams, Derek Webb, Josh Rouse, Lostline, Coldplay, Wilco, Radiohead, Bob Dylan, Crosby Stills Nash & Young, Joseph Arthur, Jeff Tweedy, Aaron Vaught, Ryan Adams, Woody Guthrie, Johnny Cash, Bono, and Jim James. 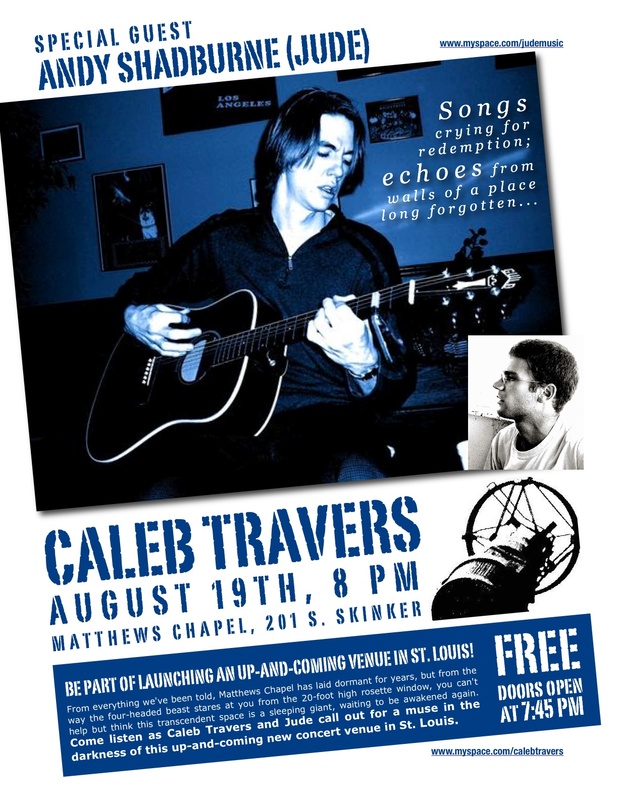 The show starts at 8 p.m. (doors open at 7:45) and is free to all. If you’re in town, come on out. One more event this coming weekend for those in St. Louis: Sunday is the last day for the Centering on the Grand exhibition, which explores the creative and cultural district of St. Louis known as Grand Center. The exhibit takes place at The Contemporary Art Museum St. Louis, and we may try to go – it looks pretty neat. For some content today, there are several new book reviews of late (one of which is mine) up at Writers Read. Also, check out this very interesting (and long) piece in The Atlantic Monthly about the history of Wikipedia entitled “The Hive: How an Attempt to Build an Online Encyclopedia Touched Off History’s Biggest Experiment in Collaborative Knowledge”. Megan and I went to bed late last night – about 2 a.m. – which is atypical for us. She was planning school for the girls; I was reading Spurgeon, after which I watched a few episodes of season four of The X-Files until Megan finished up. As God would have it, the kids woke up this morning with more energy than should be allowed to children of parents who went to bed at 2 a.m. Over cereal (which Megan poured before scurrying to the shower for a few moments of peace), our oldest mentioned how this morning was a good one so far, wasn't it, Dad, and wasn't it great they were ready for church? Indeed it was, I said, groggily chasing a blueberry through the leftovers of my Life (which would make a great tagline for a blog somewhere if anyone's looking for one). I then suggested everyone get some quiet time on their beds reading/resting before going to church (this was as I was scurrying off to the shower to get a few moments of peace myself). I have no idea what my kids are on this morning, but whatever it is, I want some of it. Learner just turned in the last of his Pastoral Theology book reflection papers. He says that Andrew Purves’ Pastoral Theology in the Classical Tradition was a needed read for the sake of his historical understanding of the call, role, and office of pastor. According to Learner, the irony of Purves’ book and those pastors he studies within it is that almost each one, at some point, purposely and aggressively (and sometimes even physically) fled God’s pastoral call on their lives. It became humorous (and humbling to him) to read of these men and their strong belief in one’s need to be clearly called by God to the pastorate as evidenced by their hesitancy to embrace such a call because of their own perceived inadequacy. Learner’s questions: how did they relinquish their fears and submit themselves to God and such a great call? And how did they justify this change in perspective to themselves, their friends, and those who they were to serve in this call? After all, it wasn’t that the terms of the call changed; rather, they did in considering it. What must this process have been like for each man? For most of his life, Learner has written off the pastoral role as not being for him. This disregard has been due to his own less-than positive opinions of certain pastors from his past, as well as from certain others’ less-than affirming voices – not of him personally, but of the pastorate/church in general. As a result, he has not until now – a full year into his seminary experience – begun to seriously ask God if a pastoral call is his desire for him, as he came to seminary with a view to teach in academia, not to pastor. Learner wonders about inquiring as to this call is what God would have him do? After all, with regard to a call to the pastorate, shouldn’t he simply just know, making the decision of “Will I or won’t I accept it?” the key question rather than “Am I or aren’t I called in the first place?” From his reading of Purves, both questions – only in reverse order – seemed in play in the lives of those studied: “Am I or aren’t I?” first; “Will I or won’t I?” second. The scary part is that in asking the first question first (which he’s beginning to do, and should have done before), the second question becomes scarier to consider…and answer. But then again, maybe that’s the point with regard to the seriousness of the pastoral call. A couple days ago, Megan sent me this link with the subject header, "You're going to love this!" Don't get me wrong: we've enjoyed our time at our local YMCA. And, as we do receive a scholarship in order to belong, we were glad to lend our name (as well as our daughters' picture, though the photographer didn't take a very good shot) to their fundraising efforts. However, we need to clarify that a statement like "They found their way to the Edward Jones Family YMCA and their lives haven’t been the same," or the quote attributed to Megan that "It (the YMCA) has had a tremendous impact on our daily lives” is more hyperbolic than true. We like the Y, but our lives aren't that different because of it. I also wouldn't say the impact on our daily lives has been all that "tremendous" (truthfully – unfortunately – it's not even been all that "daily" for most of the summer). It's interesting how sloppy endorsements can get sometimes. It's also intriguing how very quickly our culture applies descriptions of "life change" and "impact" to things that really aren't able to live up to either moniker (insert your own examples here). Before I seem too judgmental, let me say that I have done the same thing – with experiences, books, or even baseball – and that's to my shame. Truly, the only real "life change" and "impact" is the Gospel, "for it is the power of God for salvation to everyone who believes" (Romans 1:16). So, if you came across our YMCA endorsement (which you probably didn't until now), we hope you took it with a grain of salt. And forgive me for any past or future indiscretions that ascribe more "life change" and "impact" to things which may not have the capacity to be either as well. One of the best things about seminary is the amount of time the professors save you by focusing your reading on the "best" books and articles published, as read during their own life of study. And yet, there is so much of the "best" that I will unfortunately never get around to reading, that in thinking about this for too long, I can get depressed. So many books, so little time. The challenge I face now, however, is how to cull from all the "best" that I do get read what will be most meaningful and helpful to me (and others) further down the road. I've always been a reader, always been one to chronicle significant quotes and passages as I came across them; the problem now is that I come across so many so fast, it's impossible to keep up. For instance, just in the past week, I've read stellar articles/chapters from John Calvin, George Herbert, Charles Spurgeon, and Dietrich Bonhoeffer. One of the assigned books I read during the last week of July was a summary of the writings of early church fathers Gregory Nazianzus, John Chrysostom, Gregory the Great, as well as the Reformer Martin Bucer, and Puritan Richard Baxter. By the weekend, I'll have read a series of pieces by philosopher Francis Schaeffer, British pastor John Stott, and my favorite pastor/writer, Eugene Peterson. My highlighters (yes, "highlighters" plural) can't take much more of this abuse. Read and highlight everything assigned, either on time or eventually (even if it's a year from now). With one year under my belt, I've done pretty well keeping up, but I do have a short list of book titles and page numbers from past semesters that I plan to read at some point. Read carefully but quickly. The more you read, the faster you get in doing so. Though I read quite a bit before coming to seminary, the increased amount of reading I've done since arriving here has increased my reading speed. I've never timed myself, but little bad habits of re-reading previous sentences and reading only a few words at a time (instead of chunks of words) are gone. Read as privilege and not as drudgery. I'm fortunate that I've always loved to read, but I can still feel overwhelmed at times by the amount of pages and words to get through. That's when I pinch myself that this is a part of what I'm not only expected but called to do, and I'm grateful this calling is matched by a desire and ability to fulfill it. and the fit inheritance of generations and nations." but a thousand books are not too many."